Free Dust Director – Receive a free Dust Director to use on your angle grinder with the purchase of any 20 diamond blades. Learn more. Versatile – Designed for Grinding Brick Mortar Joints, Now Used in All Industries: Stone & Tile, Crack Chasing, Concrete, Plumbing, Electrical, Carpentry ~ Whenever you need complete dust containment. Dust Director™: 96% Dust Control Efficiency for your Angle Grinders – With Complete Visibility of the Diamond Blade. 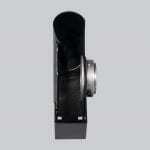 One Guard to Use with 4″, 4-1/2″, 5″ and 6″ diameter blades. Versatile designed for tuck pointing ~ A+ for Cut-Out Projects and Crack Chasing. Comparison – Dust Director compared to other dust guards. Testimonials – Including customer feedback on increased productivity. 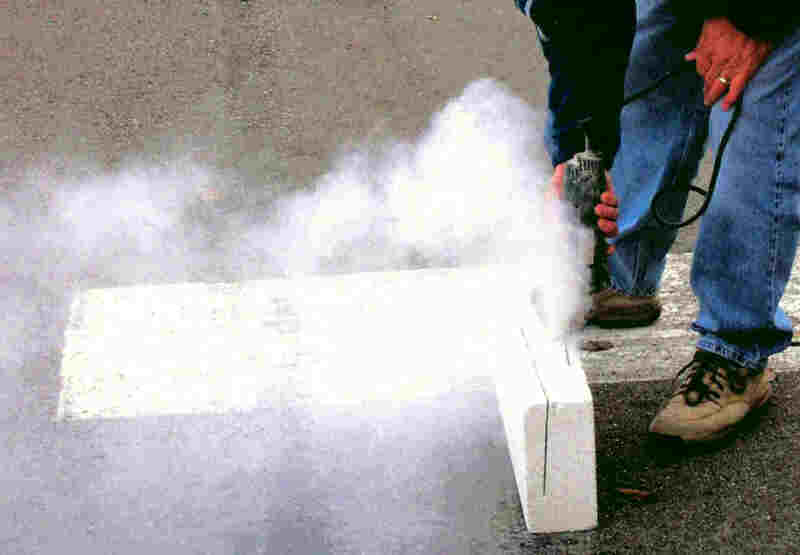 OHSA Compliance – Understanding the Silica Dust & Asbestos Exposure Rules. Labor Cost? What is the best angle grinder for Tuck Pointing, Productivity, Durability? Click here for Test Results. To this: Over 99% Dust Containment Efficiency. Cut Anything: All types of material: Masonry, Concrete, Steel, Fiberglass, etc. 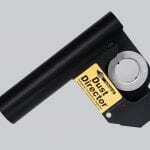 Dust Director with a Vacuum Package: Dust Director Vacuums with Self-Cleaning Filters. Free Dust Director - With a purchase of any twenty (20) diamond blades. See Blade Package below. 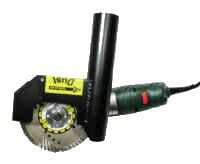 Installs onto your angle grinder – No need to purchase a separate or specific angle grinder . . . 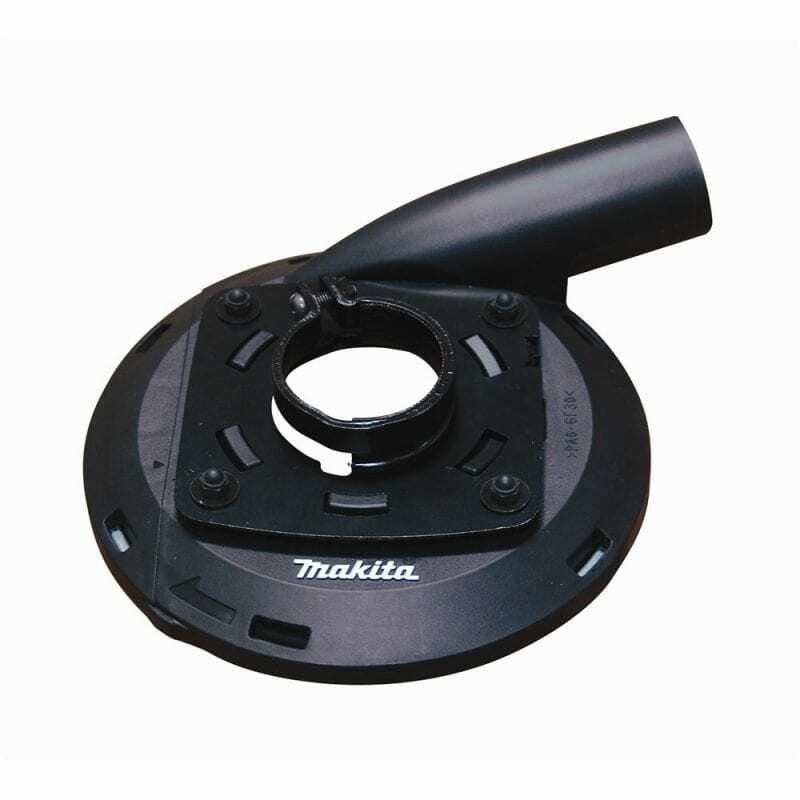 Uses specific collars match a wide assortment of angle grinders. Best Features: Simplicity, Durability – Complete Blade Visibility: Made of HD aluminum for lightweight durability. The “wide” opening of the housing provides complete visibility of the work surface (you’ll literally watch the dust coming off the blade, going up into the exhaust port) – while containing over 96% of the dust. The wide open housing enables operators to completely view their work area for better control and accuracy of cut…helping to prevent accidentally cutting into adjacent bricks. #2. Cutting a Wall’s Inside & Outside Corners. 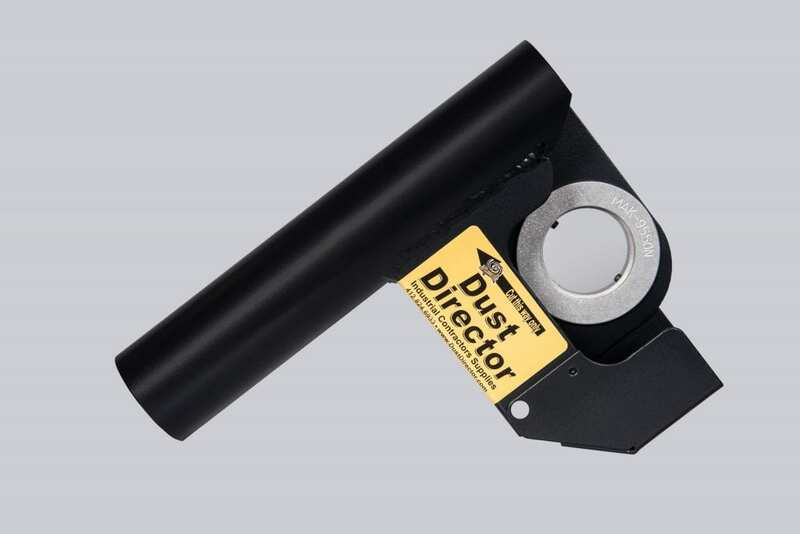 The Dust Director provides complete 180° blade coverage. 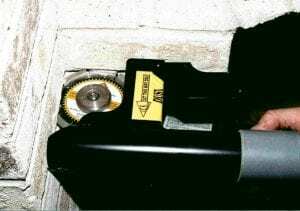 By unsnapping its extension cover you expose another cutting edge on the diamond blade, which is used to cut a wall’s inside or to get into tight areas. When approaching a wall’s inside corner, turn-off the angle grinder and un-snap the Extension Cover. You then proceed with the Dust Director to cut into and out-of the inside corner . . . easily helping to improve productivity on the job. #3. Cutting in Tight Areas. 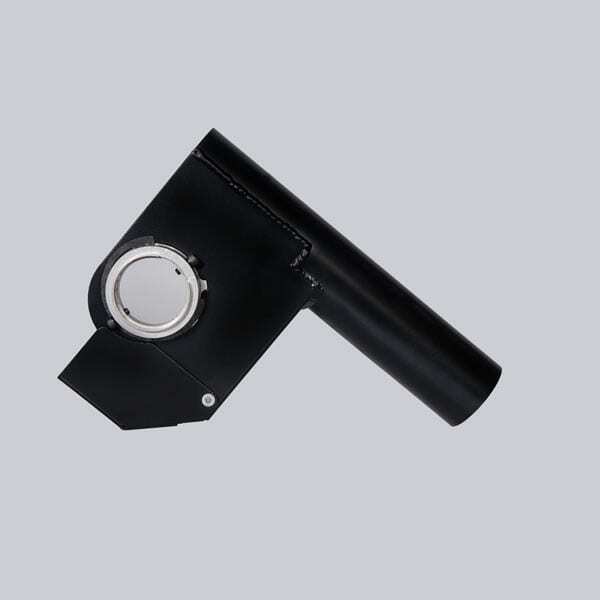 Being able cut with the extension cover un-snapped also enables the Dust Director to cut into tight areas, such as inside fireplaces – while still maintaining effective dust control. 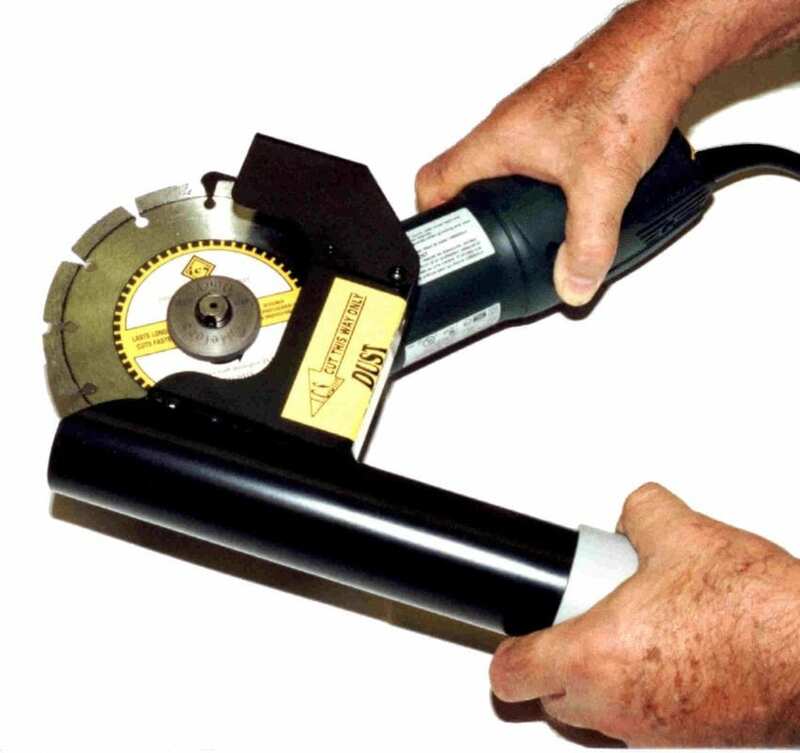 Regardless of angle grinder size (4-1/2″, 5″ or 6″), the Dust Director accepts 6″ Blades. 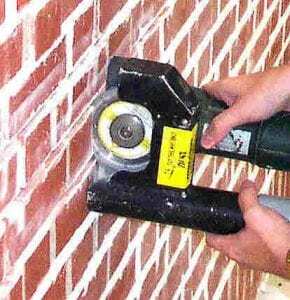 Productivity Tip: Many contractors use 7″ – 10″ diamond blades to grind horizontal mortar joints. Although these blades provide faster productivity and longer blade life (compared to 5″ blades), they also require larger and heavier tools (7″ and 9″ angle grinders or 8-1/4″ and 10-1/4″ circular saws) which increase operator fatigue. 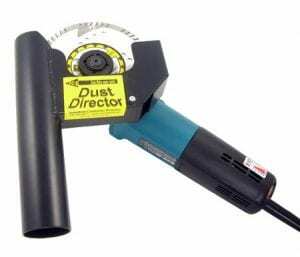 SUGGESTION: Use a 6″ diamond blade in the Dust Director and a small, compact 12 or 13 amp angle grinder. 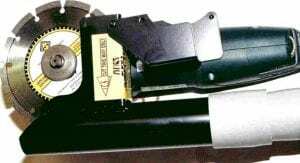 This Cruise Control Angle Grinder is about the same size and weight as a typical 8 Amp 4-1/2″ angle grinder, while having the power to handle a 6″ blade. Depth-of-Cut Capacity. A Dust Director accepts a 6″ blade. #5. Grind Recessed Mortar Joints. Many brick and stone walls have recessed mortar joints (especially stone walls with their irregular and protruding outward shape). 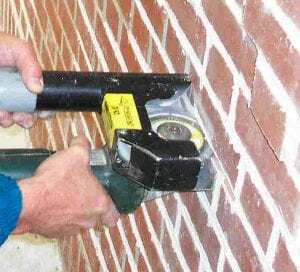 Regardless of the grinder’s size, being able to use 5″ and 6″ blades with the Dust Director enables you to effectively grind all types of recessed mortar joints. 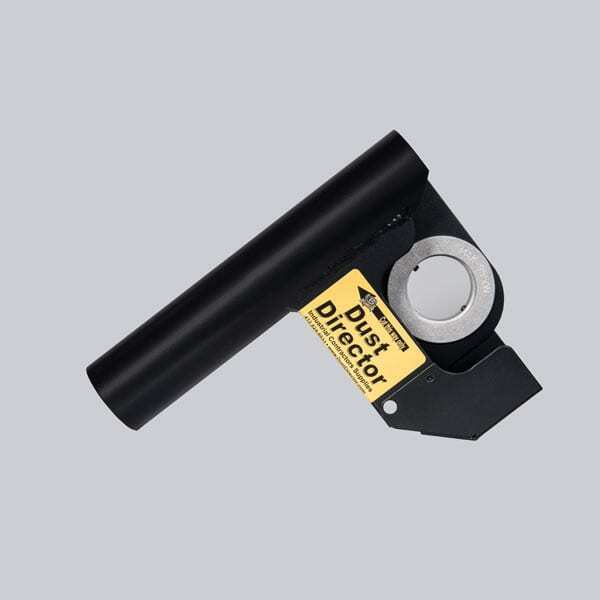 The Dust Director’s 2″ diameter barrel provides a convenient handle for using the tool and worker comfort. The extra wide diameter eliminates or prevents chunks of mortar or concrete from becoming lodged inside both the guard and the barrel. FACT: When cutting concrete or masonry, besides powder, chunks of debris are also broken-off. 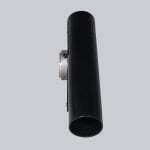 The 2″ wide barrel eliminates large pieces of solids from becoming lodged inside the guard . . . thus prevents productivity downtime of removing debris from inside the guard and blocking the dust port. To using it . . . to its versatility . . . durability . . .
And being able to Completely See the Blade and the Cutting Surface. The Dust Director® was specifically designed at the request of the Masonry Union (Brick Layers and Allied Craft Workers). As the years have past, many of those men who where instrumental in not only the design of the Dust Director® but in the cause to reduce silica dust exposure within the work force have move on . 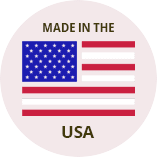 . .
MADE in the USA – 100% from USA Metals & Manufacturing. American Ingenuity, American Design – Manufactured and brought to market after working and meeting in the field with Masonry Contractors and Construction Safety Personal like yourselves, to understand what you wanted and needed in a dust control guard. An American Original – Not Imitated and Copied or Analyzed by Lawyers to Circumvent its Design. ALUMINUM WEIGHT – NOT PLASTIC. Weighs less than the steel guard that is included with the angle grinder. 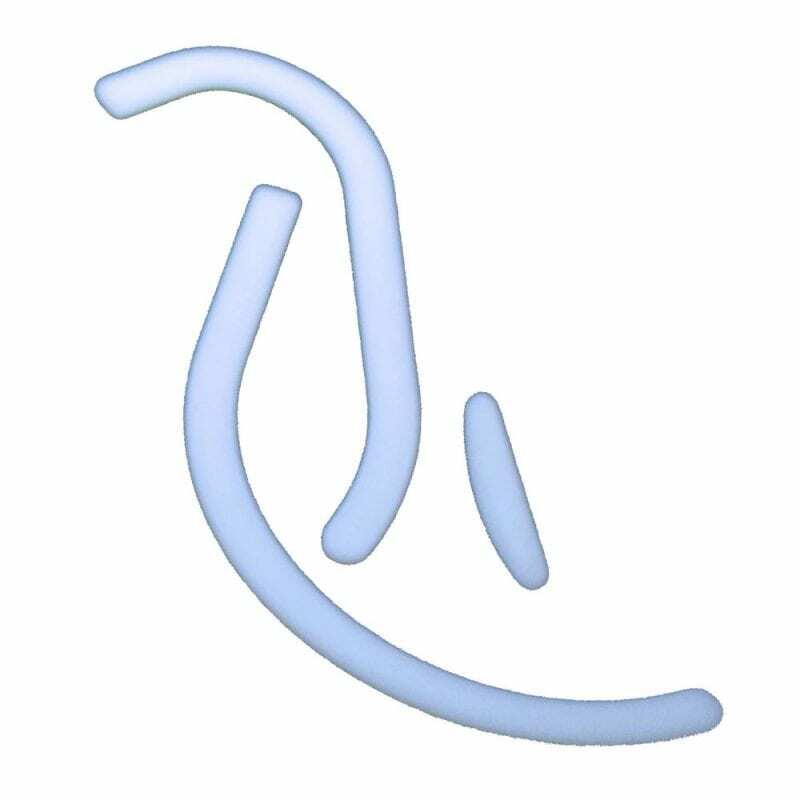 Clear plastic guard quickly cloud-up with dust, they heat-up, and break very easily. Adding extra features increases a product’s size, bulkiness and weight. Versus the slim-line, lightweight design features of the Dust Director. Install and adjust the Dust Director to the angle that you want to cut with . 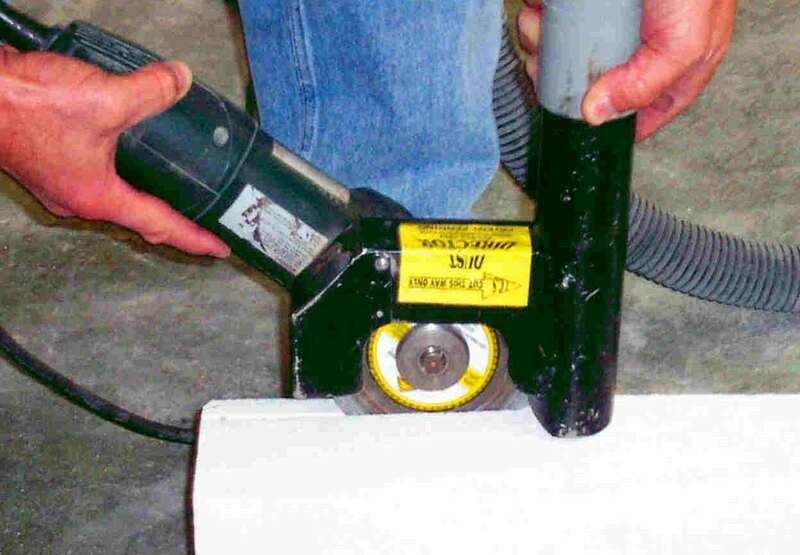 . .
All other dustless guards are locked into specific cutting / grinding positions, telling you how to cut . 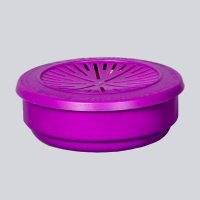 . .
Extension Cover – Unsnap the Dust Director’s extension cover to cut into tight areas, cut into and out-of a wall’s inside corner – while maintaining dust control. Dust exposure levels are below the NIOSH established Exposure Limits for Silica Dust Exposure – See NIOSH “TEST RESULTS” (bottom of page) for the Dust Director’s effectiveness in containing the dust. When we ask contractors and bricklayers to put together the vacuum and dust guard they’d like to see tested the Dust Director® figures prominently. And whenever we do the tests the guys operating the grinders like the fact that you can see more with the Dust Director®. It might be worthwhile from a business point of view to verify that the Dust Director® is ANSI compliant and advertise accordingly. Finally, a dustless tuck pointing system that works . . . We asked him to help us find a way for our members to cut without the dust and he made the complicated simple, durable and worker friendly ~ Providing Complete Visibility of the Blade. A comfortable tool to work with, lightweight, completely wide open, great blade visibility. I always said, “Give the men comfort, and they’ll give me production. Before using the Dust Director, we cut 4 – 8 hours a day and spend 4 hours cleaning up. Now we’re cutting 10 – 12 hours! Dusting of an Entire Room!